Have you suddenly, somehow lost all the contacts on your iPhone? Well, this is a common problem for iPhone users. It can happen when upgrading to the latest version of iOS, when you reset the device or for any other reason. Losing your contacts can be especially stressful since you are unable to communicate with family, friends or business associates. In this article, we share with you a few credible solutions to help you restore contacts on iPhone. One of these solutions is a powerful data recovery program known as iMyFone D-Back. Let's get started! When you mistakenly delete your iPhone contacts, you can easily recover them back from iCloud. To restore contacts from iCloud, make sure you are logged in to your iCloud account. 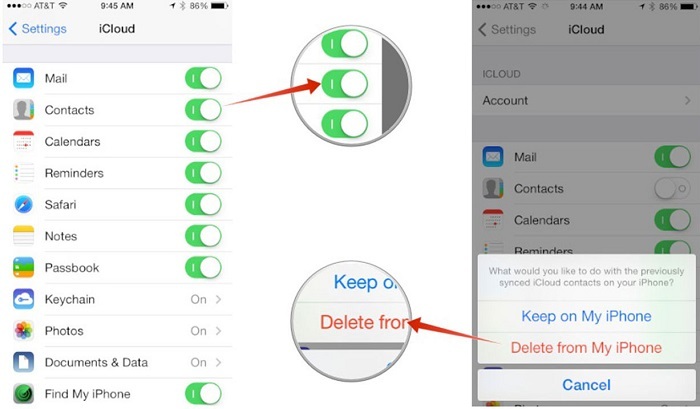 The steps below show how you can get back all your missing contacts on iPhone from iCloud. Step 1: On your iPhone get to "Settings "app. Click on it then hit on "iCloud." Step 2: Next, tap on the "Contacts" option. If in case it is already on, just turn it off then turn it on once more. Step 3: A message pops up asking you on what you'd want to do with the contacts already on your iPhone. Simply choose "Delete from my iPhone" option. You can choose to Merge contacts when asked. Step 4: Get to "Phone" apps or "Contacts" app and you will get all your contacts back. You can recover all your lost iPhone contacts from your iPhone anywhere with network. You may not need to fix your iPhone to the computer. It allows you to restore lost contacts separately instead of retrieving back all the data in the backup within a snap of a finger. 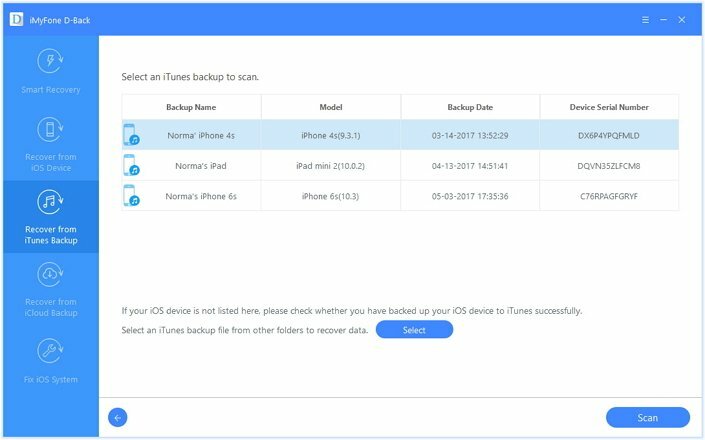 A major demerit of recovering iPhone missing contacts from iCloud backup file is that you will neither preview nor perform selective recovery of files. To add, this recovery mode requires to be connected to Wi-Fi and without it you cannot recover your contacts. You can also recover contacts missing iPhone with the help of iMyFone D-Back iPhone data recoverySoftware. iMyFone D-Back is a special data recovery tool that helps you to recover lost or deleted data from your iPhone. It is compatible with both Windows and Mac OS. iMyFone D-Back allows you to recover data such as photos, videos, contacts, calendars, notes and more. Allows you to check through the data it finds before you can recover them. 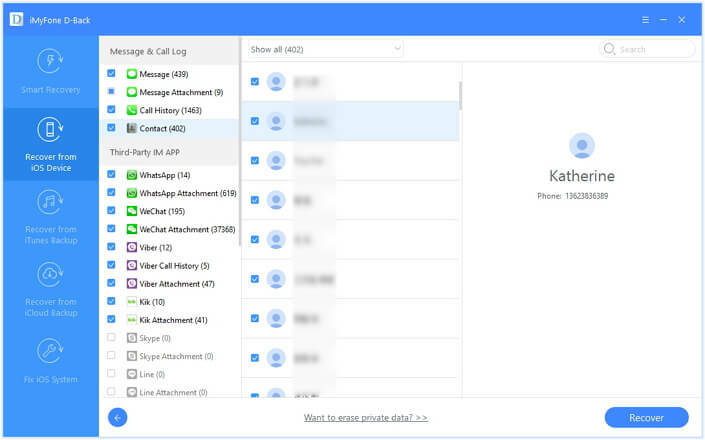 Restores data such as contacts, voice memos, photos, notes, third-party messages like WhatsApp and many others. 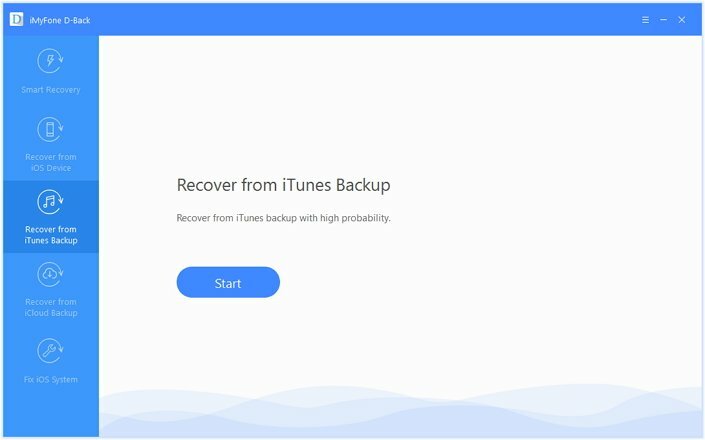 Recovers data lost due to various reasons like accidentally deleting files, resetting iPhone, and lose or damage of a your iPhone. Supports iOS 12/11/10/9/8/7 running on iPhone X/8/7/SE/6s Plus/6s/6 Plus/6/5s/5s/5. We will introduce how to recover missing contacts from iTunes backup in the following text. You can also choose other 3 recovery modes. The steps are similar. Step 1: Launch iMyFone D-Back and click "Recover from iTunes Backup" tab from the left pane of the main window. Pick the file varieties that you wish to retrieve. Check "Photos" for recovering only pictures. Step 2: iMyFone D-Back will display the backup files. You can then pick the backup file from which you would like to recover the pictures. Once selected, click the "Scan" button. The scanning will require a few minutes before completion. Step 3: The interface of the software will display all the recoverable images from the phone once the scan is complete. Browse according to the requirement, or check "Only show the deleted files" tab. You can then pick individually. Proceed by clicking "Recover" button. Step 4: Create a folder and select the same to allow the application to store all the recovered images. Allow the process to complete before browsing the folder. iMyFone D-Back is one of the best software programs to recover missing contacts on iPhone. Try it Now! How to Partition Hard Drive? Don’t Miss the Method!